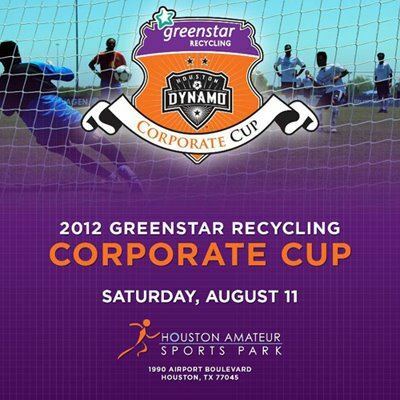 This weekend, Aug. 11 and 12, a UHD team will compete in the 2012 Greenstar Recycling Houston Dynamo Corporate Cup soccer tournament. The 14-person co-ed team, made up of UHD students, faculty and staff, will compete against 23 other teams from organizations including EP Energy, CITGO, the Houston Dynamo, IKEA and Direct Energy. UHD will begin the tournament at 8:45 a.m. playing CITGO, meet Subsea Project Solutions at 11 a.m. and finish the day against the Houston Dynamo corporate team at 1:45 p.m. If the UHD team makes the semi-final round, the team will play at 9 a.m. Sunday, with finals scheduled for 10:15 a.m. The tournament will be held at the Houston Amateur Sports Park, 12131 Kirby Drive, Houston. Parking is $5 per car.